New years are often about new beginnings. New Year, new you, new years resolutions, starting fresh, and all. I’m sure a lot of you have already been making plans and have been getting busy. Others of you may be sitting back and still contemplating exactly what needs to happen. For me though, it’s not that a new year has begun, but the fact that the holidays are over, parties are done, decorations are taken down, and routines have returned. I actually like cleaning up and seeing the house fresh after all the clutter of decorations. Winter begins, and so does the freshness and clear mind the comes with getting back on track. What are some areas you’d like to get back on track? I want to plan better for this year’s garden. I want to get a new surge of energy for the last half of the school year. I want to go over what I have in food storage and consider what I need to add to my bulk supplies. I want to plan more make-ahead meals for the freezer so we can eat better and be more frugal. All of this can seem very overwhelming if I think about it all at once. Where do I start? I know I need more resources in a lot of these areas. Even if I think I have a handle on some areas, I feel like I really want to improve in other areas and it would be great to have more resources. Soooo…….just in time! The 15 Day Challenge! Even if you don’t decide to participate in the Back to Basics Book Bundle, you can still benefit from the 15 Day Back to Basics Living Challenge – which is why this is the aspect I’m focusing on for you. 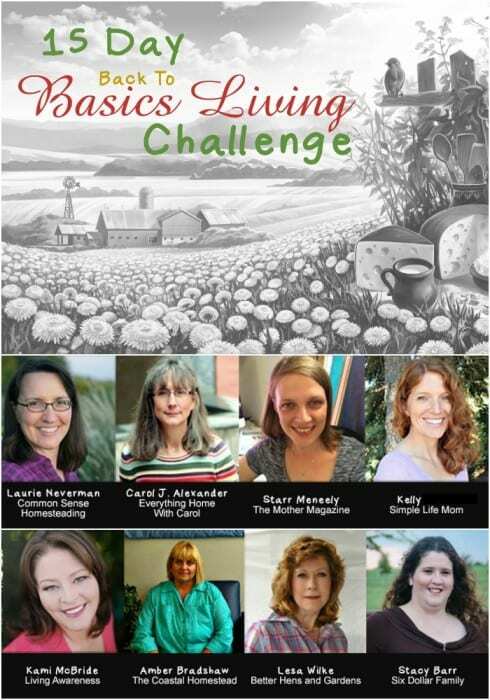 The 15 Day Back to Basics Living Challenge starts 1/10/16. That’s right. It starts now! 15 days, 15 emails (one from me!). Each email covers one of the topics below and has a free printable or recipe to help get you going. All free. That’s it! There will be links to the previous emails if you’ve missed a day. plus there will be mention of The Back to Basics Book bundle which has 55 books on all of the topics that are covered in the 15 Day Challenge. You don’t have to get the bundle to be part of the challenge. Yes, mine is on the topic of DIY. I can’t wait to see what the other great authors are bringing. I, of course, have signed up to get the 15 emails and am ALSO taking advantage of the Back to Basics book bundle as well (I mean, have you SEEN the books being offered?? They’re exactly what I need! ).